Morning all, I have been up since silly o clock watching royal wedding footage on tv and its all just brilliant! people are really getting into the spirit of it! We have the bunting up as you can see, we are probably only one of 4 houses to do so, but just down our road they are having a street party and preparations are in full swing. So what ever you are doing today have a great day! I will catch you over the weekend with some makes and a brand new challenge over at Craft your days away which holds a bit of exciting news! thanks for sharing Lisa! I laughed at the silly o clock term. Hope you had a fun day and the weather stayed calm. Hope you had a lovely day. 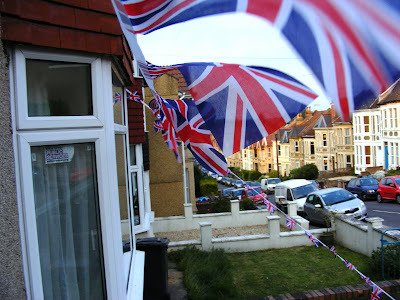 We tried to get bunting but it had all sold out! !